If you dont have pesto sauce, just stick with the usual pizza sauce for making this pizza sticks. 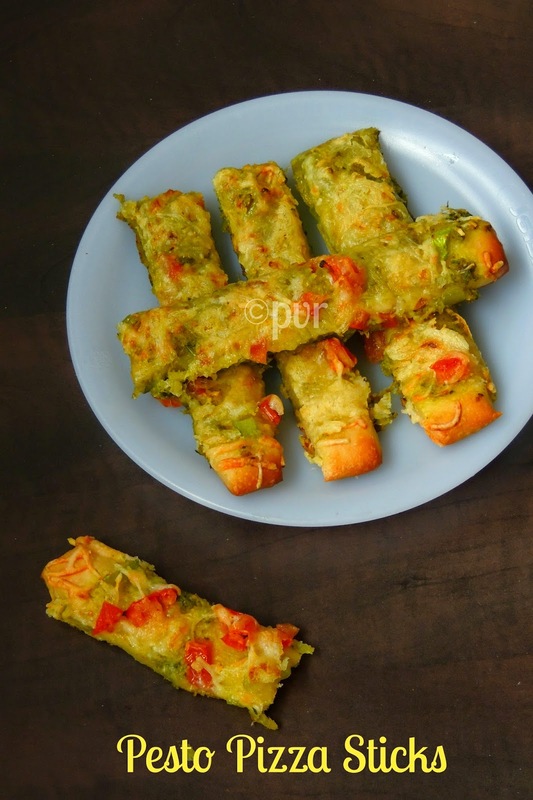 I have added few chopped bellpeppers and tomatoes to this pesto sticks as i want make more colourful. You can add any herbs to give more aroma but i skipped adding herbs since i used pesto here. Obviously you can mix and match the toppings in this pizza sticks as you desire. This pesto pizza sticks goes to this week's blogging marathon as i picked pizza snacks as theme.Check out the Blogging Marathon page for the other Blogging Marathoners doing BM#43. Roll the pizza crust very thinly, transfer it to a baking sheet lined over a baking tray. Spread the pesto generously, top it with chopped tomatoes, chopped bellpeppers. Sprinkle the grated cheese generously and cut it as shown in the picture. Those sticks looks really delicious. Nice variation. Pizza sticks look great! very creative way to use the leftover pizza dough. Looks very delicious dear. Wow..the pizza sticks are innovative.I like the pesto base. Looks truly addictive.. Very tempting pizza sticks..
Buonissima..che voglia di prenderne una fetta. I like to use pesto sauce on my pizza too. These sticks look very delicious, Priya. Simple yet delicious Pizza Sticks! 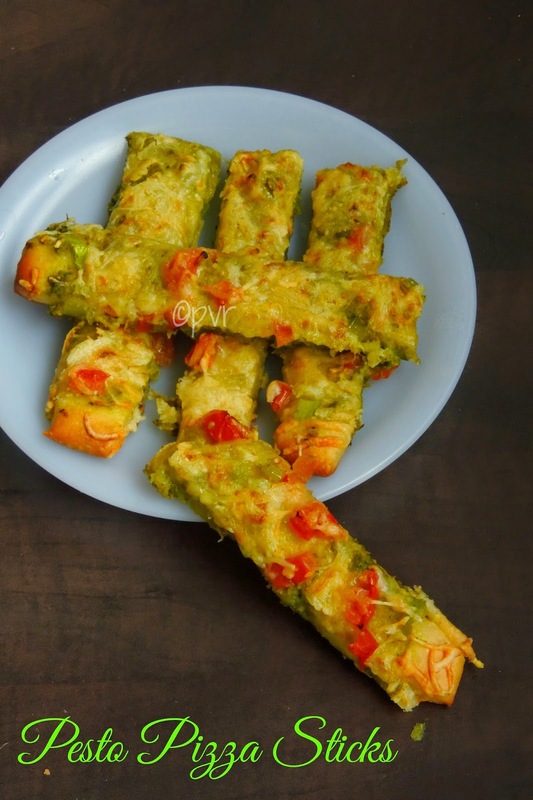 Lovely preparation dear..
Ahhh these pesto pizza sticks look so tempting and delicious..
Another delicious pizza! You're killing me with all this awesome recipes! Simply too good Priya, can imagine the flavors there..
What a lovely snack Priya..even I had these sticks in mind, of course with tomato sauce..this is surely bookmarked! Such a wonderful snack , lovely ! Lovely idea of using a pesto sauce!